Metta Skincare is created for you and your skin with an environmental and social consciousness. An ancient style of meditation - Metta encourages love and kindness with yourself and the world around you. Regular practice of Metta fosters a sense of belonging and a pure connection with other living beings, plus a compassionate understanding of the interconnected world - what's not to love about that? Metta Skincare helps reconnect your daily skincare routine to nature through a practice of loving kindness for your skin. The aim of Metta is to help create a world based on freedom, harmony, cooperation, prosperity, justice and kindness where all people and the planet can thrive. 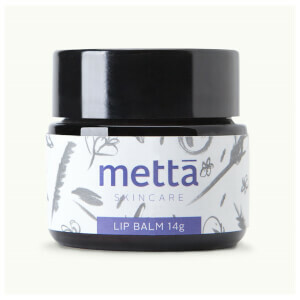 Lovingly hand made in Melbourne, Metta Skincare has a product for all major areas that tend to get dull or dry including face, lips, hands & body. Metta ensures that your whole body stays moisturised and hydrated, while soothing and maintaining skins elasticity. SHOP: Face Balm – a deeply hydrated balm formulated with rare East African shea butter, cold-pressed oils and botanical ingredients to help soften, moisturise and promote skin suppleness. Suitable for dry & mature skin. OR: Body Butter – a luxurious yet easily absorbed body butter that melts on contact with skin. Deeply comforting containing Shea Nilotica Butter with Vitamin A, E and F soothes dryness and minor irritations. Suitable for all skin types.